This summer I acquired four laying hens and a rooster. That means eggs, eggs, and more eggs! There are a lot of healthy ways to eat eggs, and this healthy egg white-veggie omelet recipe is one of my favorites. Mix egg whites together with milk and pepper; set aside. In a separate dish, place mushrooms, onions, and 2 tablespoons water. Cover and microwave mushrooms and onions for approximately 2-3 minutes on high. Drain vegetables and mix in chopped spinach & tomatoes (if using chopped tomatoes) and egg mixture. 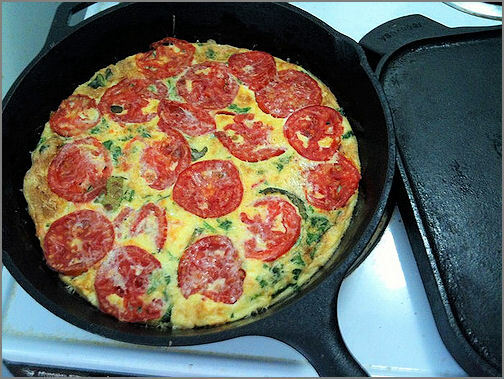 Apply nonstick spray to a large skillet and cook the entire mixture over medium-high heat. If using sliced tomatoes, lay them atop mixture. When eggs begin to set, sprinkle shredded cheese on top and allow to melt. Do not overcook, leaving omelet slightly moist; fold over one side and gently lift onto a plate.